Please note: this book was received by the reader for free through a Goodreads Firstreads giveaway. Review: Vignettes of ideal bookshelves tell such interesting stories. The whole concept of this book is for somebody to describe their ideal bookshelf – the number of books doesn’t matter, the titles of the books doesn’t matter, how they are organized doesn’t matter but in the end you get a glimpse of that person. And what a sweet book this is. Jane Mount provides the illustrations and various people tell their stories and their memories through books. From musicians to artists, from authors to designers, chefs to comedians and everybody in-between, readers are given the chance to look into the medicine cabinet of their souls. And boy, what a treat it is. I often find myself randomly opening to a page and reading about that person, reading the books they love and once again considering what I would put on my ideal bookshelf. Recommended for ages 14 and up, but especially for the reader in everyone. Of note: I have always been a person that likes to see what is bookshelves and coffee tables and nightstands. 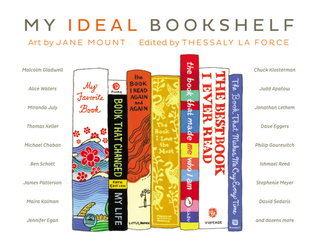 Last year I found Jane Mounts’ “Ideal Bookshelf” art on Etsy and immediately pinned it. I wanted to make ideal bookshelves for my friends’ baby gifts but since I am a broke grad student, I settled for asking for a print for Christmas for myself. After opening the print I knew that one day I would make a personalized bookshelf but in the meantime was so happy to frame and hang my cookbook bookshelf in the kitchen. Fast forward a year and I heard about this book and knew I would get it one way or another. It is truly a beautiful book and I am so thankful I received it as a giveaway.